Rinse and dry spinach. Peel and chop cucumber into mouth sized bites. Rinse and half the cherry tomatoes. Roughly chop up olives and slice red onion. Combine all vegetable ingredients in a salad bowl and toss with a 1/4 jar of Spinelli’s Balsamico. 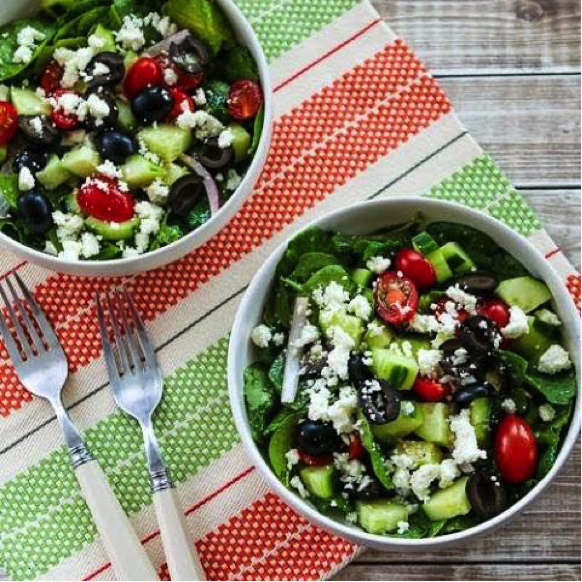 Distribute into four bowls and top off with feta cheese. Add more dressing to taste as needed.